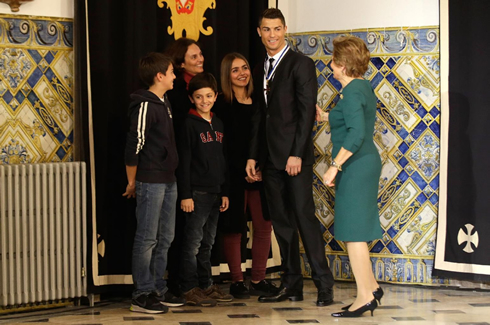 ﻿ Cristiano Ronaldo distinguished with title of "Grand Officer of the Order of Infante Dom Henrique"
Cristiano Ronaldo has travelled to Lisbon this Monday afternoon, in order to receive a state honor title from the hands of the Portuguese President himself. 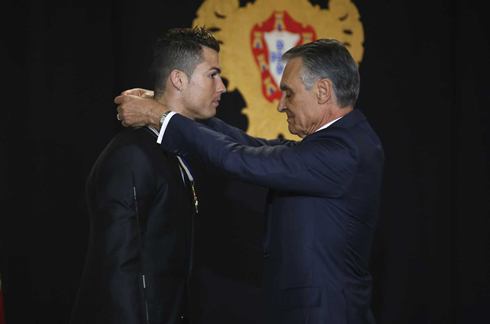 Ronaldo has earned the "Grand Officer of the Order of Infante Dom Henrique" distinction, as a reward not only for what he represents to the Portuguese people, but also for how he carries Portugal's name across borders. 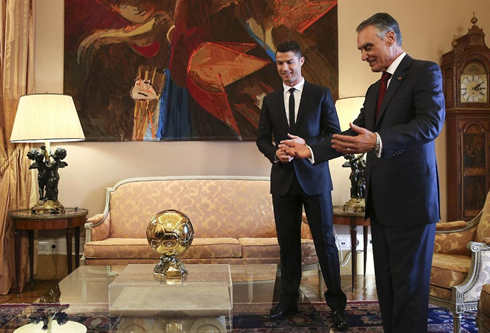 After completing another training session all alone in Madrid this Monday morning, Cristiano Ronaldo has landed in Lisbon a few hours later to receive a State distinction handed by the very own Portuguese President, Aníbal Cavaco Silva. 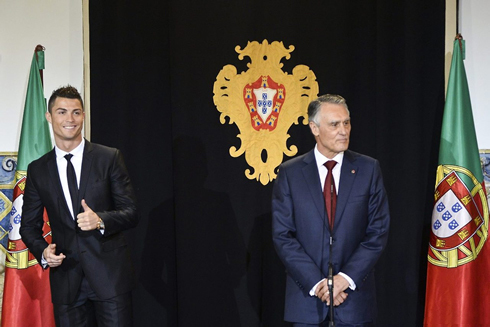 This title of honor was created back in 1960 and among other reasons it's meant to reward someone whose efforts have contributed significantly to improve Portugal's image abroad. Cristiano Ronaldo didn't stay too long in Portugal though and has already joined his club teammates in Spain, as this Tuesday Real Madrid will travel to Barcelona to face Espanyol, for the Copa del Rey's quarter-finals first leg. 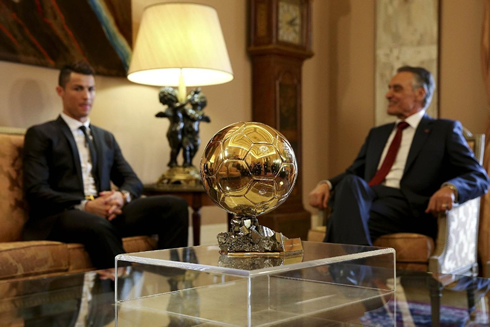 Cristiano Ronaldo: "It's a truly great honor to receive this distinction from His Excellency, the Portuguese President. It gives me more motivation to keep working even more in the future and to represent Portugal across borders at the highest level, in the best way I can", started by stating the two-times FIFA Ballon d'Or winner (2008 and 2013). Ronaldo: "I'm very happy. Everyone I love is here, except my family who unfortunately couldn't attend this ceremony for both personal and professional reasons. It's a very special moment to me and for all the Portuguese out there. I'm extremely satisfied. I hope to continue on the path I've been on since the beginning of my career, winning trophies and having success both at the personal and team level, and achieving all that in the name of Portugal", remarked the 28-year old Real Madrid forward. A lot of personalities who have been important in Ronaldo's career didn't want to miss the chance to attend this event's ceremony. Real Madrid made themselves represented by the club's president, Florentino Pérez, and the club's director of football, Emilio Butrageño. 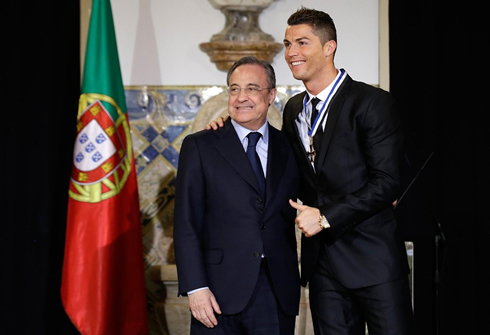 The Portuguese National Team manager, Paulo Bento, as well Sporting CP president, Bruno de Carvalho and Cristiano Ronaldo's agent from GestiFute, Jorge Mendes, were just a few other names featuring a long list of famous people that were present at the "Palácio de Belém", in Lisbon. 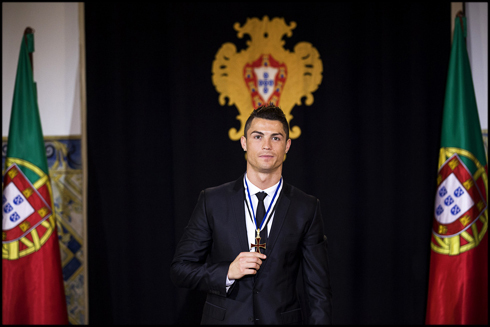 Right after the ceremony that awarded Ronaldo with this title of honor for the "Grand Officer of the Order of Prince Henry", CR7 agreed to answer a few questions from the journalists and comment on how he was feeling after receiving such a big an important distinction from his own country. 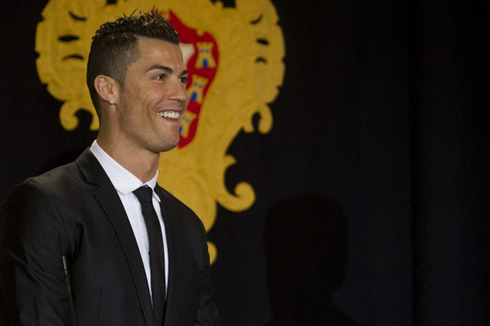 Cristiano Ronaldo: "It's obviously a very big and important honor to me, because I'm a very proud Portuguese citizen! It's a true privilege and honor to represent my country abroad at the highest level. I know that I still have many years left in me before I finish my football career, but I hope I keep winning many more awards and titles". Cristiano Ronaldo: "If we win the 2014 FIFA World Cup for Portugal, it will be a dream come true. Without wanting to despise any previous trophies and awards I've won in the past like this recent FIFA Ballon d'Or, to win something big for Portugal is what I want the most. We know it will be extremely hard though, because every other nation will want the same. One thing is for sure, we're going to give our best! ", promised the former Sporting CP and Manchester United winger. Cristiano Ronaldo next game for Real Madrid will be against Espanyol, next Tuesday night, for the Copa del Rey quarter-finals (January 21, 2014). You can watch Juventus live stream, Espanyol vs Real Madrid, Levante vs Barcelona live, West Ham vs Manchester City and Roma vs Juventus, all matches provided from our football live section.